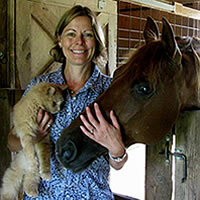 Heidi Mier practices veterinary medicine in a very special way -- a combination of knowledge of both western and eastern medicine, compassion, and her dedication to research and learning. When caring for my elderly dog, Cheyenne, she combined various therapies -- including acupuncture, natural remedies, traditional medicine and referrals to specialists when needed. She greatly improved the quality of Cheyenne's last years and also became a good friend. Not once but twice Dr. Heidi Mier extended the quality of life of our Irish Wolfhounds by using her integrative approach to veterinary medicine. At age 10, Shamrock was having difficulty standing up after lying down. A combination of Chinese herbs and acupuncture made it possible for him to run, jump and play. Clancy, at 5 ½ years old, was diagnosed with terminal bone cancer. Chinese herbs and acupuncture enabled him to enjoy eight more months of life. Dr. Mier has been our vet for nearly 20 years, and taken care of four dogs and two cats during that time. We've been through just about everything with our animals and are firm believers in Dr. Mier's approach to pet care. She's quick to respond to questions, provide test results, or general consultation. Dr. Mier is knowledgeable and stays up on current trends and treatments. Her great demeanor and "bedside manner" helps put us and our pets at ease when treating. We had two of our pets go through acupuncture with her and were initially skeptical of her approach, but the treatments worked and our pets were better afterwards. Some of our animals have had more serious illnesses and traditional treatment only went so far. Dr. Mier's use of traditional, integrative care, acupuncture and supplements/herbs, provided our pets with a great quality of life until time to say good bye. She also is extremely compassionate in the most difficult of times. She is a great advocate for our pets, and a wonderful veterinarian. We would not treat with another vet. I first met Dr. Mier in 2007 after my Doberman, Acorn, was diagnosed with bone cancer in her jaw. Given that Acorn’s condition was terminal, we wanted to make her life as comfortable as possible in the interim. When I brought Acorn into Dr. Mier’s examination room, her assistant, Jill, asked if Acorn would like a flat or fluffy bed to lie on. Acorn liked fluffy, so that’s what she got. I was so impressed that they wanted Acorn to be as comfortable as possible. I was even more impressed when I met Dr. Mier. She got down on the ground so as not to intimidate Acorn. She talked to her and let her smell her stethoscope. Acorn was always shy, but Dr. Mier took the extra time to help Acorn feel safe. Dr. Mier dealt with Acorn as an individual, which was so important to me. For the initial visit, Dr. Mier spent over an hour getting to know Acorn, evaluating her, performing acupuncture, designing an individualized diet, prescribing Chinese herbs, and perhaps, most importantly, talking with me at length about having realistic expectations. After her treatment with Dr. Mier, I could tell that Acorn felt better that evening. She had more energy, and she would eat like she ate when she was well. I am so grateful to Dr. Mier for giving Acorn a good quality of life right up to the end. All of my animals have seen Dr. Mier for various treatments over the years. When my German shepherd, Sage, pulled his ACL (anterior cruciate ligament) on an agility course, another veterinarian thought that he might need surgery to repair the damage. However, after a second opinion with Dr. Mier, we decided to follow her treatment regime. Sage never ended up needing surgery, and he is back running faster than ever in agility at 6 years of age. We are so very lucky to have Dr. Mier in the community. It’s so clear that what she does is not just a job for her, but it’s a way of life. Even though she is already certified and credentialed as a practitioner of Chinese medicine, she recently took a trip to China with a group of veterinarians to keep abreast of the latest findings in the field so that she can incorporate them into her practice. She also attended a veterinary conference, where she talked to a speaker renowned for his work on gastrointestinal problems in animals. I have a dog who has had chronic digestive problems ever since he was a puppy, and she approached the speaker to discuss my dog’s case. Dr. Mier did this on her own time and then called me when she returned from the conference to discuss some new ideas. Truthfully, how many people would do this? Dr. Mier is really more than a veterinarian. She is has an incredible mind, a love for her profession, and an unrelenting commitment to her patients and their guardians. Thank you Dr. Mier for all you do for the animals!